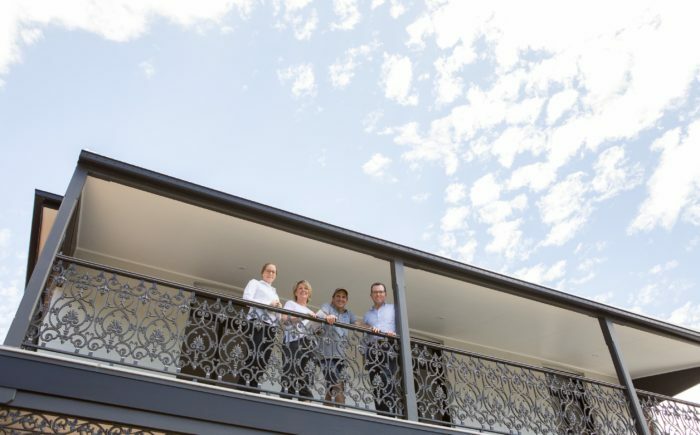 Inverell Shire Council Planning Officer Elise Short, left, Sisters of Mercy Convent and Egan House owners Jo and Digby McNeill and Northern Tablelands MP Adam Marshall on the restored verandah of Egan House. THE mammoth task of renovating Inverell’s historic Sisters of Mercy Convent has received another boost this week, with Northern Tablelands MP Adam Marshall announcing $121,500 in financial support from the NSW Government. Mr Marshall said the funding would be used for two projects – the first to help produce a blueprint to make it easier for other developers to undertake heritage projects in regional areas and the second to help restore two old verandahs to the property. He said local owners Jo and Digby McNeill would work Inverell Shire Council and architect and industry consultants and certifiers to develop a blueprint for solutions to satisfy current building codes but without destroying the integrity or heritage of old building design. “It will become a virtual road map for other developers looking to restore old residential buildings into new commercial premises,” Mr Marshall said. “It will be a ‘how to’ guide to undertake restoration works while being compliant with current standards like fire and safety or disability access, but also remaining true to the integrity of the heritage of that building. Mrs McNeill said the funding would develop a series of architectural design solutions to support the adaptive reuse of old buildings, many of them residential, to new conversions like boutique tourist accommodation. The couple embarked on their project late last year, intent on returning two buildings to their grand old glory days but in a modern context. The two-storey convent was built in 1908 by the Sisters of Mercy as their home and in 1922 they also bought the neighbouring Egan House, a double storey Victorian terrace, which had been built in about 1876 as a home for Charles Egan and was then used as a boarding house for boys. The Sisters eventually sold it in 1980 and left, and while it was vacant on and off until bought by an American for his holiday home until 2016, it came back onto the property market as a deceased estate. The McNeils purchased the whole property portfolio at auction in May last year, preparing to turn Egan House into residential accommodation with four apartments, to complement the convent renovation. Mr Marshall said the McNeill restorations were incredibly significant and impressive. “It’s an absolute gem,” he said. “What the McNeills are doing here is not only historically important but also tremendously exciting for the future of Inverell and the economic and social future of such a progressive town. Mrs McNeill said the restorations on the convent and Egan House were on track, with Egan House expected to be complete by Christmas and the convent finished by April next year.